Children both young and old can be hard to buy for. 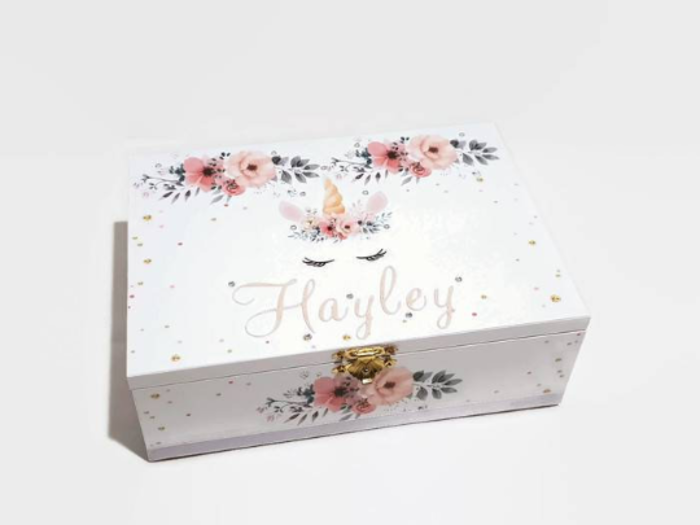 Giving a keepsake box for their treasured possessions makes for a perfect and uniquely personal gift and gets away from traditional gifts such as toys & clothes. This floral unicorn design keepsake box is perfect for any girl (young or old) who loves all things unicorns. Made from mdf and hand painted in a high quality pastel grey acrylic spray paint (no brush strokes). 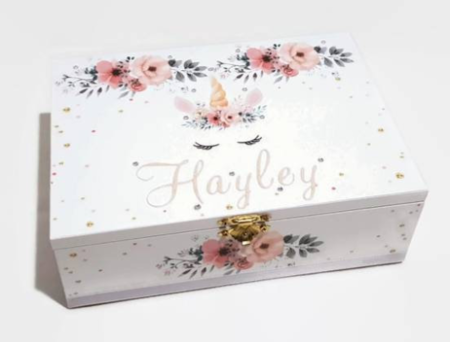 Decorated in a lovely floral unicorn design with grey, white & dusty pink colouring. This paper is sealed for protection from dust and will not age the paper. Lovingly personalised with name in a dusty creamy pink and with a little bling. Please ensure all spelling is correct as it is very difficult to make changes. If an error occurs on my end, a full replacement will be sent. A rectangle box with latch and hinges. External dimensions: 20cm x 14.5cm x 7cm. Internal dimensions: 18cm x 13cm x 5.5cm. Product may differ slightly from featured images due to photography lighting and computer/mobile resolution and varying embellishments. Please note that keepsakes boxes are a semi fragile item and over use may cause wear and tear. Dropping or mishandling may break the box or dislodge embellishments. Primarily they are designed as a decoration. Please keep out of reach of young children (under 5) as small parts may become loose if handled incorrectly and pose a choking hazard. As keepsake boxes are made from wood, please do not expose to damp or moist areas. Although the paint is cured, sticking may occur in some climates. To prevent this, please lift the lid every so often. If storing, please wrap lid separate from box. This item is handmade and as such imperfection may be present which is normal. But if there is any fault with the operation of the box (hinges etc) then I am happy to discuss a replacement. Each box is wrapped in tissue paper. If unhinged, the lid will be wrapped separate from the bottom. If hinged, tissue paper will be placed in-between to prevent scratching during shipping. Square boxes are then wrapped in bubble wrap and placed in a sturdy mail box and taped securely. Rectangle boxes (all sizes) are placed in a gift box and then in a mailing box with bubble wrap. Mailing box is secured with tap. Fragile - Handle with Care is on each mailing box but if any damage should occur please contact me directly. Depending on the issue, it may be able to be fixed. I am more than happy to assist and discuss all options should this occur. I hope you enjoy your handmade item, and it was a pleasure to create this for you. Please remember to include personalised details (name, initials, date etc at checkout.